Attention! Sonic R is, in this reviewer’s humble opinion, one of the very finest Saturn games to date and the following review will tell you exactly why. I have to be perfectly honest, when I first played Sonic R all those months ago I was more than a bit unsure about what Sega were trying to do. I mean, at the end of the day what the punters seemed to want was a Mario 64 clone on the Saturn. With Sonic in it. So they gave the programming task to the highly respected Travellers Tales and sat back. They could’ve done a platform game very easily; the game’s engine is certainly up to the task as everything moves extremely fast and smooth – and you can see by these shots that the graphical quality is well up to the standard of any of the best previous Saturn titles, but why the nagging doubts? 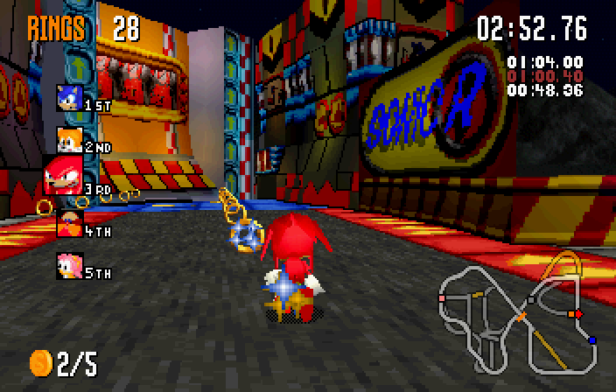 Well, simply put, I wasn’t sure what sort of game Sonic R was trying to be. At the heart of it it seemed to be a driving game, but there was also this platform element to it… you had to collect the coins and rings and then certain new sections and short-cuts open up to you. It’s only on playing Sonic R for a lengthy period that the true depth of the gameplay opens itself up to you, and it also happens to be completely brilliant. You can, if you do so wish, just play the game as a straightforward racing game – although, to be honest, it won’t take you too long to come first in all the courses (it took me about an hour). There’s five highly detailed courses to choose from at the start, complete with devious short-cuts, collectable speed-up icons and enormous ramps. Then, when you start to get to know the tracks a bit better, you collect more coins, find the ring doors and start collecting the coins. Then, and only then, does the game start to really become addictive. Once you start to get to know each level a bit more, you find that each of them has five carefully placed golden coins and it’s these you have to collect for the ‘special challenge’. Take it from me, it’s a toughie. Collecting the rings seems easy but there are carefully-placed doors that will only allow you access through them when you’ve collected the requisite amount of rings. These lead on to short-cuts through the level and, usually, a golden coin. For once, the one player options are excellent. There are four choices of solitary gaming to choose from (apart from the obvious grand prix option, where you race against the four other computer-controlled characters) and they even break the golden rule and manage to be original. For a start you have the standard time attack (complete with flickering ghost mode) and the option to use this on any of the tracks the correct way… or reverse. Then there’s the ‘Collect five balloons’ game. What you have to do here, like, is collect five hidden blue balloons as quickly as possible. Obviously, as you work out their locations your time is bound to speed up, but the short-cuts can help you even further… if you can find them. But, and this is the best one, there’s a new horse to the stable, a tag game. Here you try to catch up and ‘tag’ (basically, just touch them) each of the four computer-controlled characters in turn. Tricky, though, as the last thing they want to be is ‘tagged’. They swerve to avoid you, then run away in the opposite direction. They wait around the other side of the course and change direction as you try to work out where they’re heading. It’s brilliant, tricky and guaranteed to make you scream with frustration as you catch three of the characters within 30 seconds but spend the next four minutes chasing Tails around the level. So, what can I say about the graphics? They’re beautiful. If they were your girlfriend, you’d constantly be laughing like a demented fool about your good fortune. If they were your boyfriend then you’d guard him carefully from the weeping adoration from your less-fortunate friends. They’re that gorgeous. If they’re not the best yet seen on the Saturn, they’re certainly up there with the best of them… the likes of NiGHTS, Tomb Raider and Sega Rally spring to mind. What’s most impressive about the graphics is, like I said before, it’s not just the fact that they look stunning or the fact that the shaded fade-in (there’s absolutely none of that disgusting pop-up you might have expected) looks dazzling, it’s the fact that Travellers Tales have managed to get all this working at such a bloody speed. Not only is it remarkably fast, but it’s also smoother than a freshly poured pint of Guinness on a roasting Summer’s day. Even on some of the more complicated levels, where there appears a million and one objects on the screen at one single time, it’s reassuring to know that there’s not even a smidge of slowdown. The sound? Ah, created by the very talented Richard Jacques at Sega Europe, there’s a bevy of delightful tunes for you to pick and, to keep in with Sega’s bizarre interest to include vocals on their background tracks nowadays, they’ve got some old has-been warbling on in the background about how nice it is to be going so fast. She probably didn’t have a bleedin’ clue what she was singing about but, thankfully, there’s an option to switch off the vocals. There’s a total of five very different and fairly large tracks at the start of the game (with another one hidden away for release when you’ve completed all the other five in first place) and this might be a bit of a down point (I’d have liked a few more, but that’s only because I enjoyed playing the game so much), but because the game gives you the freedom to explore the levels (levels/tracks… it’s difficult to work out exactly what to call them, so I’ll switch between the two if you don’t mind), it’s quite some time before you can even begin to say you know the layout of the tracks (levels?). This has the downside of making it a bit daunting when you first start playing, as you’re not entirely sure where you should be going and everyone’s overtaking you on the short-cuts, anyway. You start off the game with a choice of the basic four characters and each of those has their own pros and cons (although we have to admit, Sonic is the best overall). There are various methods for collecting the extra five secret characters. One of the main things that distinguishes them is a character move. Sonic has an impressive double jump (excellent for short cuts), Tails can fly, Knuckles can… oh arse, you’ll find out when you buy the game. There’s got to be a downside to everything and the spoilt plum in this fruity basket is the lack of a championship mode. Sure, you can play all the tracks against a range of computer-controlled characters but, unfortunately, you have to play them one at a time. There’s none of the ‘play through all the tracks and get something nice at the end for winning them all’ treaty thing of Sega Rally here, I’m afraid. Not a huge bugbear… more of an irritating teddy. So, there you have it. 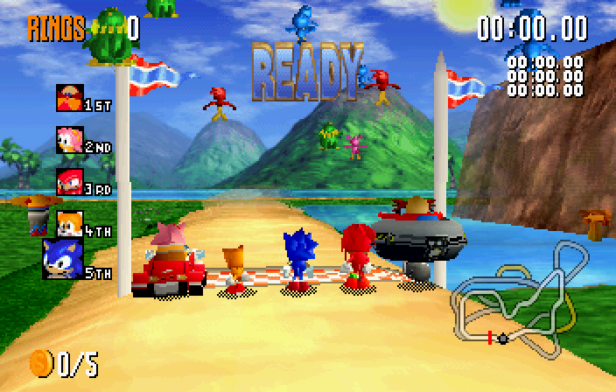 At the very heart of Sonic R is a powerful racing game that looks gorgeous and is fast and smooth. Now that on its own would be all very well and good but it’s the sheer depth of the game and the slowly rising difficulty level of the challenges that will keep you playing for the weeks to come. The highest recommendation I can make is that this is, quite simply, one of the finest Saturn games I’ve ever played. Brilliant, accomplished, professional, polished… but two years too late. Had Sonic R appeared for the Saturn’s first Xmas, Sega’s 32-bit machine would undoubtedly be scoffing a larger share of the videogame market pie as I write. Not that, of course, I would be writing this. In an alternative dimension, a near-identical universe mirroring our own (but with subtle differences), Sonic R stayed at the top of the Gallup charts for months after its ’95 release. And rightly so. It’s an excellent game. The finest yet seen on the Saturn – and blimey, you should just see them moving. The familiar beeps and whistles from the original Sonic games, plus the usual cringy tunes. A couple of great two-player options and a great time attack mode. Loads for everyone. There’s loads hidden away and you’ll be playing the time attack mode for weeks. I found this one of the most refreshing and enjoyable Saturn games I’ve played for ages… if it’s not the best Saturn game yet, then it’s very close.